Pastor Rudy Fidel is a Canadian with an enormous heart for Israel. He visited Israel for the first time in 1986 with Dr. Ingrid Bergner, then pastor of Faith Temple in Winnipeg. Dr. Bergner visited Israel in 1967, just two weeks before the Six Day War and returned seared with a passion for this holy land. And her visit came at a time of great fear and tension in the Land followed by the jubilation of victory after the Six Day War. 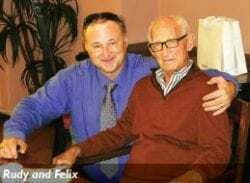 It was Bergner who mentored Rudy through his long years at Faith Temple, and Rudy inherited the leadership of the church after she passed away. But he not only undertook the leadership of the church – he undertook the mantle of leading groups to Israel. Rudy has been to Israel 18 times and is planning another trip this coming fall. But his devotion to Israel begins with his love for the Jewish people, and that love, in turn, was a direct result of his personal decision to follow God. “It was God who put that desire and love in me, who empowered me to follow His word and His Torah,” explains Fidel. “I have a love for Judaism and I believe it’s totally wrong to try to convert Jews to Christianity. We believe in the same word. God was first God to Israel, and now we as Christians have also received the same God as our Redeemer. As Christians we have a duty to serve our older brother, the Jewish people, helping them concerning God’s promises towards the Land of Israel.” Rudy first experienced anti-Semitism while on a visit in Australia where he was invited to speak about Israel. Someone in the audience became angry with his zeal for Israel, reflecting attitudes of British Israel Replacement Theology. Rudy was incredulous that anyone who reads the Bible could believe that God was done with the Jewish people, that He would renounce the promises He had made to them so many years ago. And perhaps it was that brush with anti-Semitism that propelled him to connect with Jewish people all over the world. In 2003, Rudy was visiting Turkey when two synagogues were attacked by Muslim terrorists. Rudy was deeply moved by this event and upon his return to Winnipeg, he celebrated the 50th anniversary of his church by hosting a kosher brunch to which he invited the Winnipeg Jewish community to help raise funds for the Turkish Jewish community. In 2005, Rudy personally delivered the funds raised at that event to the Neve Shalom Synagogue in Istanbul. Rudy serves as the Christian head of the Jewish-Christian Roundtable in Winnipeg and has also helped Jews who are still in Cuba. Rudy first became aware of CFOIC Heartland in 2007, when a Jewish friend in Canada put him in touch with Dror Vanunu of the Gush Katif Committee. Rudy was eager to contribute to a worthwhile cause in Israel and his friend recommended the Gush Katif refugees. He visited the temporary Gush Katif refugee area in Nitzan and met Sondra and Dror during that trip. On a subsequent trip to Israel, in 2008, Sondra met Rudy’s tour group and introduced them to the work of CFOIC Heartland. A few months later, Rudy hosted Sondra at Faith Temple in Winnipeg where she was able to share her work with Rudy’s entire congregation. 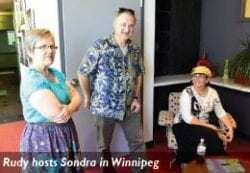 And Rudy hosted Sondra again in Winnipeg last summer.